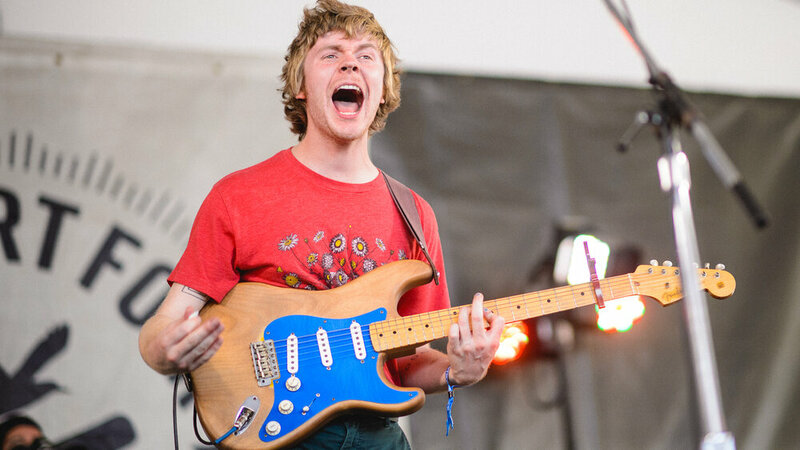 Pinegrove had been booked for the smallest of the festival’s three main stages. The day before its Newport set, the Montclair, N.J., band had played the main stage at the Panorama Music Festival, where headliner Frank Ocean would perform later that day. For a band that still practices in one member’s parents’ basement, Pinegrove has accumulated a huge, enthusiastic fan base over the year since it released its latest studio album, Cardinal. Those fans spilled out from the tent over Newport’s Harbor stage on Sunday afternoon and sang along as Evan Stephens Hall and his bandmates (accompanied by their trusty stuffed sloth, Lincoln) played tender songs about home, friendship and growing up. Pinegrove’s been called indie-rock, alt-country and even emo, but the band’s pure melodies and Hall’s erudite lyrics transcend those descriptors. As wild percussion breaks and seamless rhythmic switch-ups gave way to subtle banjo picking, a crowd of 20-something festiva lgoers — for whom this set was the one that mattered most that weekend. Pinegrove have released their new album Skylight through Bandcamp. The album is available in a pay-what-you-want format. All proceeds from the album will be split between three charities: Musicares, the American Foundation for Suicide Prevention and the Voting Rights Project. The album was announced on Wednesday as part of a Pitchfork profile on frontman Evan Stephens Hall, who was accused of “sexual coercion” in 2017. The Pitchfork piece delved into the accusation and resulting fallout, and gave Hall, as well as a mediator for the alleged victim, a chance to elaborate on what had happened. Reactions to the piece were divided. Some were happy to see the band emerge from a murky, ill-defined situation, but others felt that the redemption was unearned. Near the end of the profile, Hall revealed the band’s plans to self-release Skylight, and that all Bandcamp profits would benefit charity. After a number of different releases and years of touring, Montclair, New Jersey’s Pinegrove have offered their finest work to date with their newest LP, Cardinal. The band’s captivating blend of indie rock, pop and country elements is more vivid, fine-tuned, and addictive than ever before. Vocalist/guitarist Evan Stephens Hall and drummer Zack Levine (drums) form a core that has been playing together since early childhood. Painting his emotions onto these songs with colorful and kinetic strokes, Hall moves through Cardinal’s eight songs with unforgettable energy and passion, with a vocal performance that is pleasantly reminiscent of Will Oldham and Built to Spill’s Doug Martsch. 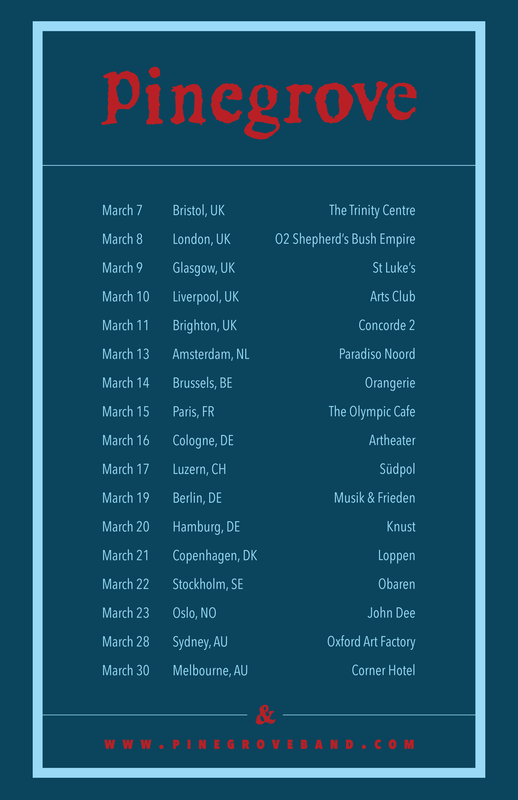 The band are playing a few UK shows , plus this newly released track, it’s a new song from the new batch of tracks that we just recorded. we don’t have any more official info to give u on those recordings right now but we can tell u that they are finished & ready & we are really proud & as a celebration we are releasing one song. it’s called intrepid. one of the things these new songs explore is the emotional & creative experience of geometric space. this song in particular considers distance, the outer rim of the magnet’s pull. how the size of the world can bring our personal relationships into focus. We’re offering Cardinal and the rest of our catalogue up for ‘pay what you want’ & donating all the proceeds to Southern Poverty Law Center. Please give what you can. Somewhere between the proto-emo of the likes of the Appleseed Cast and the backwoods folk of Whitney , lies New Jersey based outfit Pinegrove, a band who emerged from the depths of Bandcamp to appear on numerous end-of-year-lists with their album “Cardinal” released in 2016. Capitalising on that surprise success, Run for Cover Records have re-released this compilation of the band’s early work. Everything So Far does a nice job in charting the Pinegrove’s progression into the bookish and lovelorn brand of indie rock they later perfected on Cardinal, marked out by vocalist and main songwriter Evan Stephens Hall quavering tenor and perambulating and pleasingly funny guitar lines. As with such completist compilations there’s a fair chunk of filler here, and over time its 21 songs begin to congeal into each other a shade, but as an introduction to the band’s many charms, it’s solid enough.